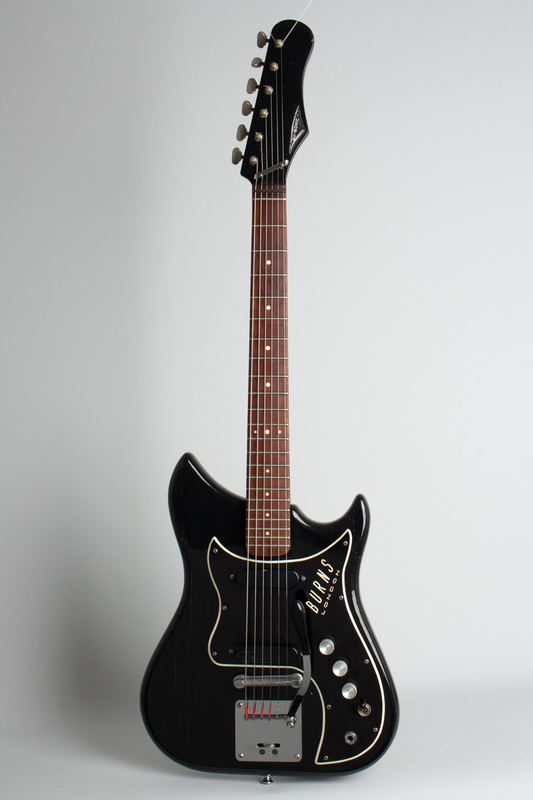 Burns Nu-Sonic Model Solid Body Electric Guitar (1964), made in London, England, serial # 7748, black polyester finish, Agba wood body, maple neck with rosewood fingerboard, black gig bag case. 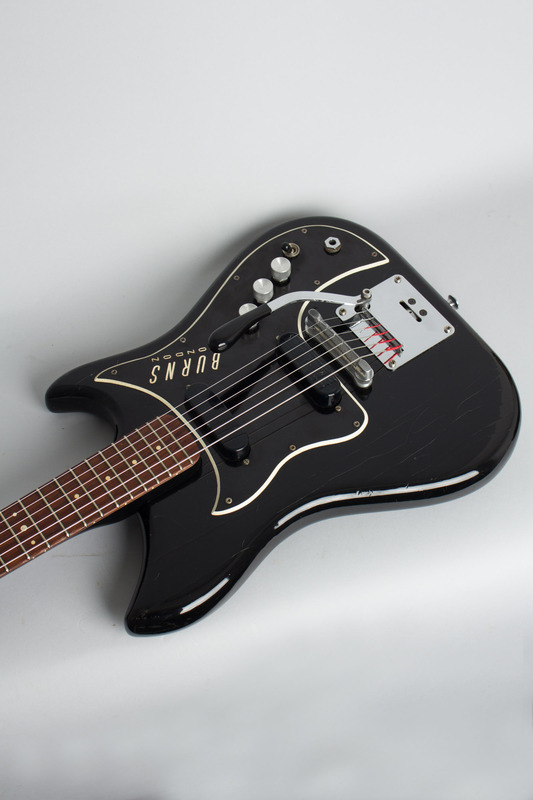 The handy and frankly rather cute Nu-Sonic guitar was introduced in mid-1964 as Burns of London's student-level instrument, intended to replace the original 1960 Sonic series. 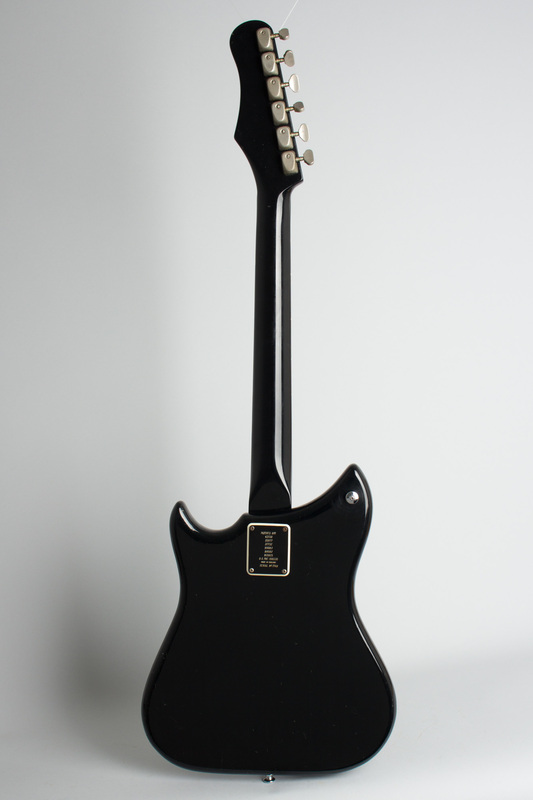 The model was offered as both a guitar and a bass, listed in cherry or black finish at around half the price of a flashy Bison or Marvin guitar, making it roughly the UK equivalent of the Fender Mustang. 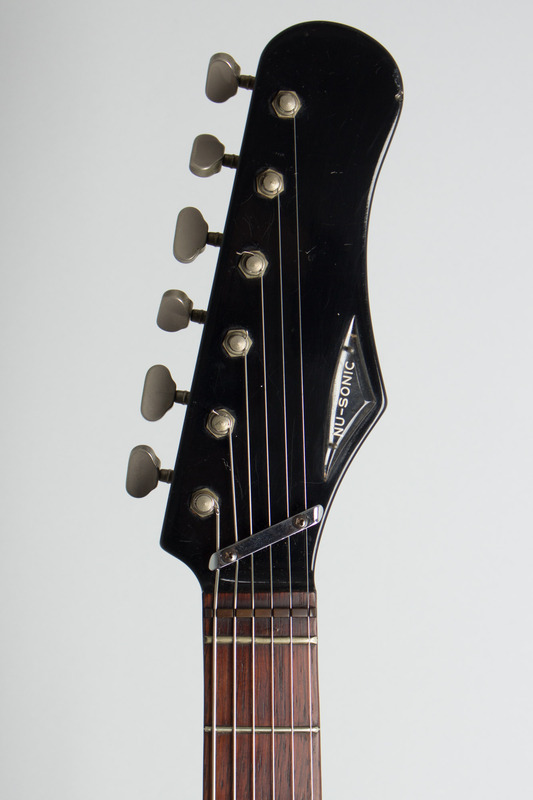 Although the solid black Polyester seen on this guitar was listed as a stock finish option, the great majority of Nu-Sonics that turn up are in a transparent cherry livery -- this fairly early ebony guitar is a much harder to find instrument. Despite its lower-budget intentions, the Nu-Sonic is a very well-made guitar and was not particularly cheap by contemporary standards. Perhaps in light of this, it was one of the first models to be dropped by Baldwin after they bought the Burns company in September 1965. As the Nu-Sonics were discontinued by the fall of 1966, the total production run was very brief at only about two years. Burns-logo'd examples like this are quite rare, especially in the US. 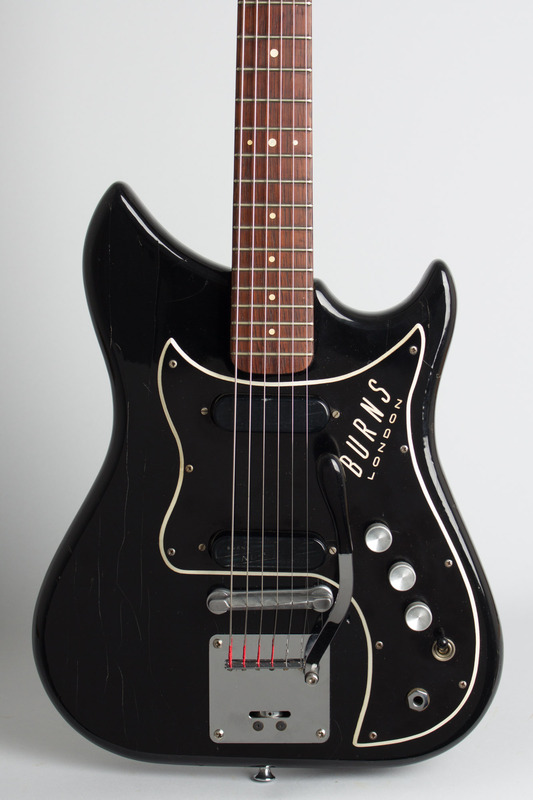 This particular guitar was built in 1964 and is one of the later Burns-logo examples. It is fitted out with two single-coil Nu-Sonic Pickups under engraved plastic covers, a 3-way switch, a master volume, and individual tone controls. The vibrato is simple but effective, and despite its student origins the Nu-Sonic makes for a good-sounding and surprisingly versatile package. The Nu-Sonic is a very light and comfortable guitar, its handiness belying it with a snarly tone. 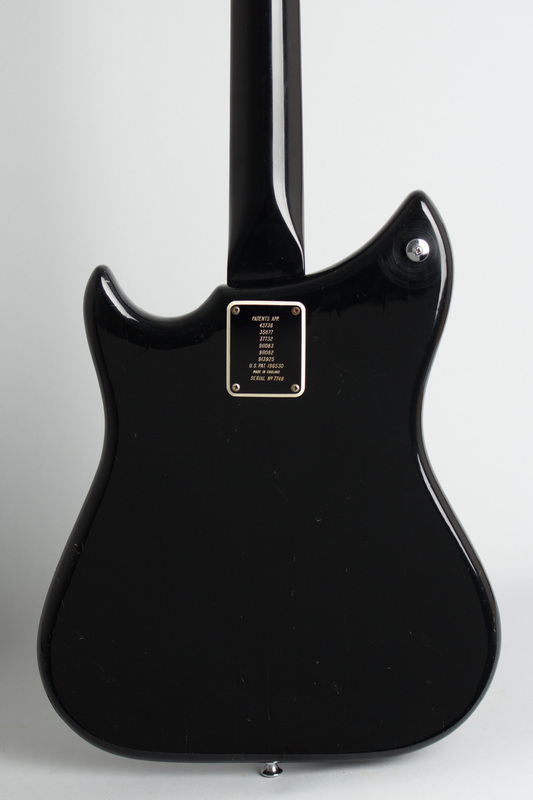 This early black-finished example is a cool UK Burns rarity and neat little player's guitar. Overall length is 37 7/8 in. (96.2 cm. ), 13 in. (33 cm.) wide at lower bout, and 1 1/2 in. (3.8 cm.) in depth, measured at side of rim. Scale length is 23 3/8 in. (594 mm.). Width of nut is 1 11/16 in. (43 mm.). 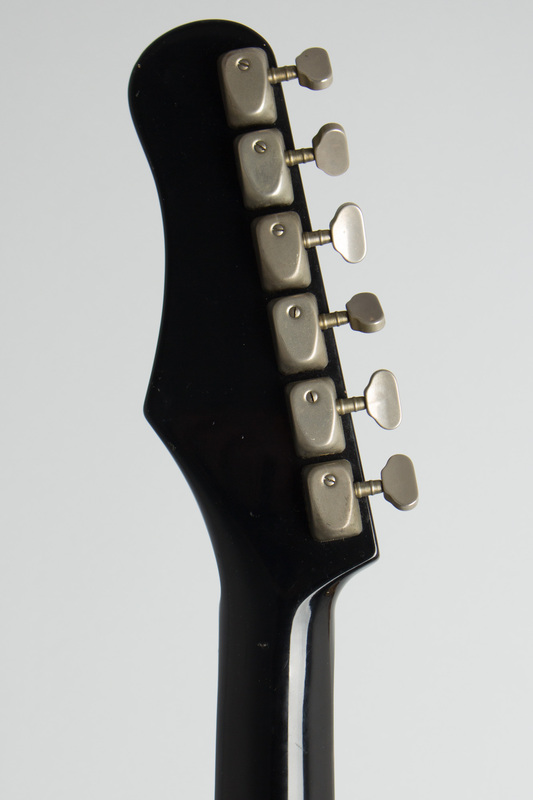 This is a relatively clean guitar overall, showing some of the typical finish checking common to these UK-made guitars but with no major wear or finish flaking. It is original and complete -- including the often missing vibrato arm -- except the knobs appear to be correct-style reissues. There is a small crack in the top of hard plastic pickguard under the volume knob, but it is still quite solid. This striking Nu-Sonic looks super cool, plays very well, and is simply one of the lightest and handiest electric guitars ever made; a neat beat-era survivor. Overall Excellent - Condition.